St. Paul’s Hospital has been a West End landmark for more than a century. With plans in progress for a new St. Paul’s on the False Creek Flats, it’s time to appreciate the history of this historic site. The 1100 Block West Georgia circa 2018. The first Vancouver Art Gallery (VAG), an Art Deco beauty, was constructed in 1931, demolished in 1985, and to add insult to injury the site is now home to Vancouver's Trump Tower. The 1931 opening featured a modest collection of British historical paintings but only seven works by Canadian artists. Those humble beginnings laid the foundation for what was to become a collection of more than 10,000 pieces. The first VAG was constructed in 1931 on a 132-by-66-foot site donated by the City of Vancouver at 1145 Georgia Street, several blocks west of the current VAG location. Built at a cost of $40,000 it was erected in a lot between a row of houses and a service station in what was then a residential area at the edge of downtown. Designed by Vancouver architects Sharp and Thompson, the Art Deco structure was built as a single floor of gallery space. The façade featured a frieze on which the names of great painters were carved, and the entrance was flanked by busts of Michelangelo and Leonardo da Vinci. The building was expanded in the early 1950s to three times its original size in order to accommodate 157 works by Emily Carr, which the artist willed to the province of British Columbia upon her death in 1945. Fundraising for the expansion was led by Carr’s close friend, Group of Seven artist Lauren Harris, who was instrumental in raising $300,000 toward the project, a sum matched by the City of Vancouver. 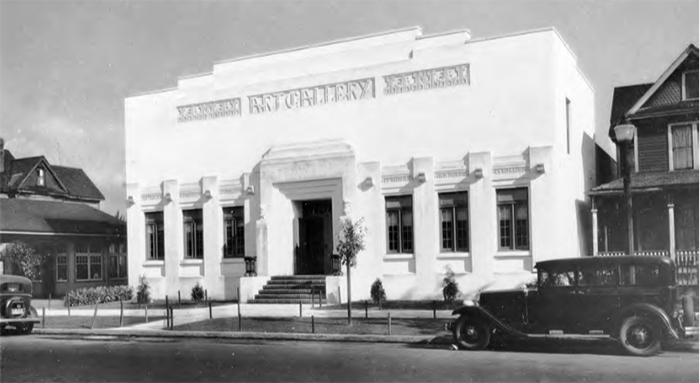 Removing the Art Deco façade, architect Ross A. Lort remodelled the gallery in accordance with the International Style popular in Vancouver at the time. The Gallery remained at this site on West Georgia until 1983, when it moved to its present location in the old Courthouse building. And we have all seen the modern tower that has replaced this Art Deco treasure. Roedde House's fascinating past, and important present as a neighbourhood arts venue. Revisit the legends and debunk a favourite myth surrounding the West End's beloved Sylvia Hotel. Second Beach Pool, now open until September 17, has a fascinating history of its own, and wasn't always the state-of-the-art facility you know today. There are big plans afoot for the West End's historic Rogers family mansion, The Gabriola. Historian Janet Leduc brings us up to speed. The corner of Georgia and Gilford has seen many changes, from horse show palace to regimental headquarters to luxury high-rise apartments.